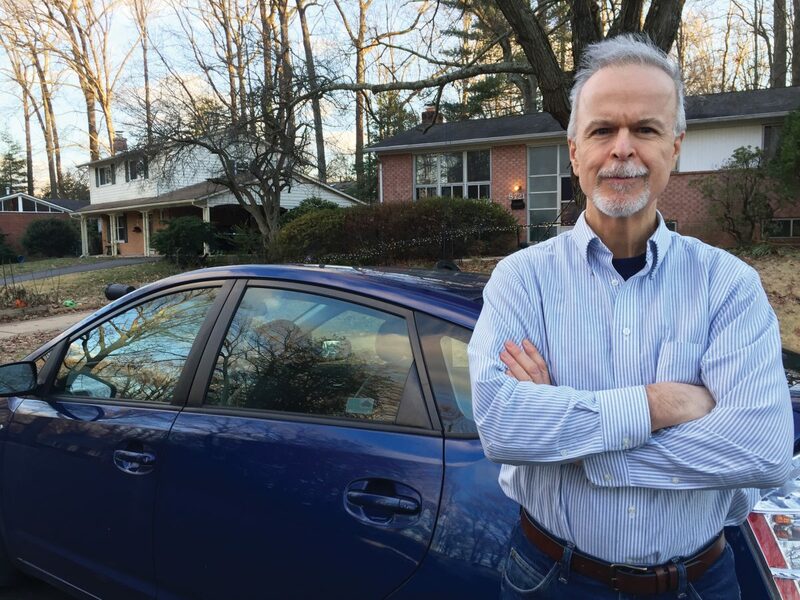 Dave Young in front of his Prius. An egg hit the window of my blue Prius and broke. The yolk ran down the glass. I was just a block from my home in the northern Virginia suburbs, driving my family back from a Trinity play. Anger suddenly rose up within me. What if I had lost control? My family could have been hurt. I could have hit someone! I’m gonna get the perpetrator! I pulled over, got out of the car and started searching. No one was on the street, so I stalked into the backyard of one of the houses, but it was empty. My wife Karen pointed to some egg on the ground near a driveway. I knocked on the door of the house. No answer. We drove home, and I switched cars and went back, parking nearby. Sure enough, soon a high school-age boy came out of one of the houses and began wiping egg off the street. I got a good look at him, went home and called the police. The officer who came out told me he couldn’t do anything since no one had witnessed the incident. I replied that I felt compelled to go back and talk to the boy’s parents. If one of my children had thrown an egg, I’d want to know, I reasoned. A few hours later, my resolve about returning to the house had weakened. My peace had returned, my car was clean and I was back to my life. I was ready to move on and really didn’t want to go up the street and confront anyone. But something inside of me—I’m convinced it was the Holy Spirit—urged me to return. I walked over to the house and noticed a car in the driveway, and a man, the boy’s father, watering some plants. He looked at me warily. I explained what had happened. “Did he have blonde hair?,” he asked. “That’s my son,” he replied. He apologized courteously, telling me that his son wasn’t home, but that he would have him apologize to me and clean the car. I thought about ending the conversation and returning home, but again the Spirit prompted me. “Is there some adversity going on in your son’s life?,” I asked. Soon the dad was in tears, telling me that his wife had left them that fall. As he shared his story, I consoled him and prayed with him, telling him that he was a hero for doing all he could for his children during such a hard time. Before I knew it, more than an hour had passed, so much time that my wife later told me she had been worried about me. The next day, I went down the street again and met the boy, but by that time my heart had done a 180-degree turn. I felt no need to give him a piece of my mind. I was an advocate and encourager instead of the adversary I had been the previous day. Over the next few months, I stopped by the house to visit the father and son, taking time to joke, listen and encourage and pray with them. I became friends with the father, and the son and I developed an easy rapport. Eventually, the family moved from the neighborhood and we lost touch, though the father and I remain friends on Facebook. This experience has reminded me that good can come from anything that the world or the devil throws our way . . . even an egg. So glad you followed the Spirit and helped this family in need! Great job, Dave!